There were ugly scenes in the Newsnight studio yesterday when rival fan groups of TV presenters squared up to each other. A fist fight broke out as anchor and arch-inquisitor Jeremy Paxman tried to intervene and keep the peace. The belligerents were representatives of fans of "thinking man's crumpet" presenters Alice Roberts, Miranda Krestovnikoff and Bettany Hughes. Alice and Miranda recently completed the latest series of Coast and Bettany is a highly-regarded TV historian. One set of fans is keen for Dr Roberts and Ms Krestovnikoff to be more adventurous in their presentation style, suggesting that they should even take their clothes off. A second set prefers to see them dressed in sensible outdoors gear, while Ms Hughes's fans joined the debate belatedly, suggesting that the women should be accepted as the talented individuals they are. 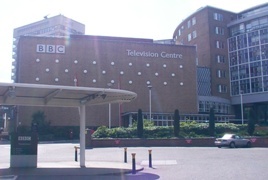 A debate between the groups was filmed at the studios of BBC2's flagship news programme to be shown after the last episode of Dr Roberts's archaeology series Digging For Britain aired on Friday night. Angry words were exchanged during the on-screen interview, especially when Mr Paxman suggested to fan club chairman Bernard Frot that his wish for Dr Roberts to "get her kit off" meant merely that he was a "dirty old man." Frot's response was that wishing to see Dr Roberts or Ms Krestovnikoff "au naturel" was just his members' expressing their artistic side. Referring to the spokesman for the Sensible Clothes Manufacturers' Association, Fred Ilkley-Moor, Frot added:"It's not as pervy as wanting too see them all kitted out in thick woollies and big boots. "And that Bettany Hughes lot must be a right load of poofters if they're happy for them all to keep their kit on." At this point, witnesses say, Lawrence Chondroitin, of the Bettany Hughes Is A Top Historian Club, launched himself across the table at Frot and fell rolling to the floor with him. As they fell, they caught Ilkley-Moor who started throwing punches. Jeremy Paxman and a floor manager tried to separate the brawlers, but apparently the producer told them "let's see where this goes - keep the cameras running." Apparently an expensive camera was seriously damaged and a glass table on the set was completely destroyed. It is believed that three people were treated at hospital. Footage of the fight is expected to be released internally only and is sure to become a highly sought-after collectable.